You’ve designed a footwear collection … Now what? While shoes are essential, more customers are shopping for fun and style post-recession. This kicked the U.S. footwear market up to $72.4 billion this year. The industry is expected to grow at 2.3% rate year-over-year from 2014 through 2019, reaching $35.9 billion before the close of the decade. The strongest growth is in basketball-related shoes up 21%. In tandem with that, the men’s footwear market is up 8% over the past two years, double that of the female market in the same period. The athletic footwear segment is expected to outgrow all of the others. Know what you’re up against. Half of all new businesses survive five years or more and only one-third will survive over a decade. The odds, unfortunately, are not in your favor. Starting a footwear business is more than just creating an excellent pair of shoes. You’ll need to understand the operations of a dynamic fashion industry and how your new footwear brand will expand and thrive in the future. You’ll need to understand your market size and appropriately communicate a plan to banks and lenders. That said, you’ll need to compose a business plan, organize cost sheets, develop order forms, and, finally, network with industry connections to help you accomplish your sales goals. Start ups fail because management teams become overwhelmed with death-by-paper-cut administrative duties on top of creative direction. Along with growing debt and unforeseen business expenses, failing to keep a fickle buyer and conscious consumer interested in your product will sink even the most on-trend of fashion vessels. But, if you’re one of the thousands of entrepreneurs launching a business this year, we’re on your side. Most major designers started at the same place you are in right now? They had a great idea, acquired proper knowledge to execute their plan, built and managed their business, and finally, successfully sold product through the proper sales channels – deepening their brand. To make things easy for you, we provide the answers to the test. We’ve gathered various business texts, market specific industry data, how-to guides, forms, and supply checklists to make sure you’re covered on fashion business basics. 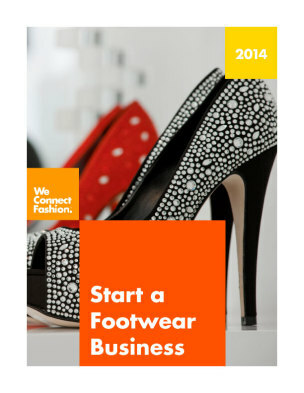 Start an Footwear Business is built by industry experts who have been there, done that. This How-To PDF publication is designed to help you plan your company, produce your product, promote your brand, and sell to buyers. Sell your Product Online - and much more….. If you want to be taken seriously by finance and investment groups, you’ll need to know the industry inside and out. How do we know? Because we’ve done it ourselves – and believe us, you need all the help and information you can get. If you have questions, email us.